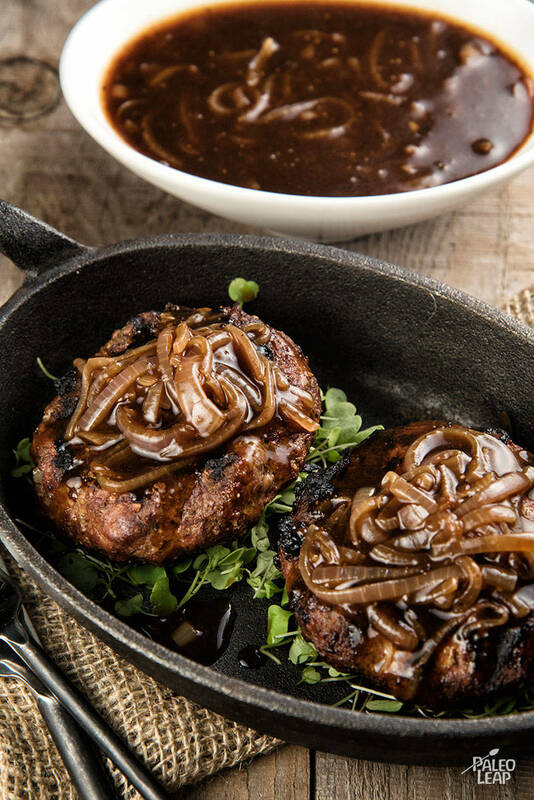 Did you know that Salisbury steak actually has a low-carb history? Dr. James Salisbury, who treated soldiers during the American Civil War, was a meat fanatic to an almost bizarre degree; he believed that human teeth were naturally shaped to eat meat and that we should limit not just carb-dense foods, but also vegetables, fats, and fruits, all in favor of pure meat. Dr. Salisbury had some pretty weird ideas about toxins and the causes of disease, but he was an early advocate of low-carb diets for patients who needed to lose weight, and as part of his diet, he invented the Salisbury steak. A Salisbury steak isn’t really a kind of steak; it’s more like a hamburger patty that got dressed up for a special occasion. Today, it’s mostly associated with TV dinners, but it doesn’t have to be something you unwrap from a plastic tray and stick in the microwave! The “steaks” in this recipe are much better than anything you’ll get in the freezer aisle, and covered in a rich brown onion gravy that would also taste good poured over whatever sides you’re having. The typical TV-dinner sides for Salisbury steak are all starchy – Dr. Salisbury would probably be horrified to see his invention served with such huge piles of mashed potatoes, macaroni, and bread. In fact, he’d probably be equally horrified to see it served with a big pile of cauliflower or broccoli, given his theory that vegetables and starches fermented in the stomach to make toxic acids and cause tumors. Fortunately, nutritional science has advanced quite a bit since the late 1800s, and we now know that it’s perfectly safe to eat your steak with starch or vegetables or both: try mashed potatoes, roasted vegetables, or anything else that would be good with that delicious gravy. In a bowl, combine the ground beef, almond meal, egg, garlic, coconut aminos, thyme, and season with salt and pepper to taste. Shape the meat mixture into six equal sized patties. Heat ghee in a sauté pan. Add onions and cook over medium-high heat until onions start to brown, stirring occasionally. Add ¼ cup of the beef stock, and continue cooking, stirring for another 10 minutes. Add wine, if using, and cook until reduced by half. Add the remaining beef stock, tomato paste, and season with salt and pepper to taste. Simmer for another 10 minutes, adding the tapioca starch 1 tsp. at the time until the gravy reaches the desired consistency. Reduce heat and leave it on the stove to keep warm. Heat some cooking fat in a skillet set over medium-high heat. Sear the patties 3 to 5 minutes per side. Pour gravy over the patties and simmer for an additional 10 minutes.